WHY BUY A RIMLESS FLUSH TOILET? The Duravit Rimless® WCs have an innovative and efficient water supply because of their open flush rim design. The result is a dynamic, powerful water flow that reaches and flushes the entire toilet. All standards, for example regarding flushing, are achieved and in some cases even excelled. The Rimless WCs only consume 4.5 litres of water per flush and can be cleaned quickly and easily due to the open rim, as dirt cannot accumulate in inaccessible areas. This can be further enhanced with the optional WonderGliss coating. The coating is baked into the ceramic and ensures that lime and dirt cannot stick to the smooth surface and simply run off together with the water. WHAT ARE THE ADVANTAGES OF WC-SETS? The sets include the rimless toilet, the toilet seat and a part of the. This is usually the concealed Durafix fixing. The toilet seat has an automatic soft-closing mechanism. This ensures a smooth and silent closing of the lid and an unintentional slamming the lid is prevented. 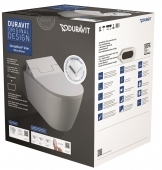 WHICH RIMLESS WCS FROM DURAVIT ARE AVAILABLE? Duravit offers rimless versions of the Starck 3, DuraStyle, D-Code and Me by Starck series as toilet set. The Me by Starck set is also available in a compact version, i.e. the toilet has a smaller depth which is suitable for smaller bathrooms. The individual product series differ from each other particularly with their design. While the Starck 3 toilets, for example, have a round basic shape, the DuraStyle toilets have a square basic shape with rounded corners. With the D-Code WCs, the more distinctive overall impression is immediately noticeable. Here, the toilet bowl overlooks further forward than the outlet and visually separates itself from the rest of the toilet. 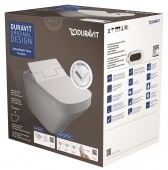 The bottom of the DuraStyle toilet also runs diagonally backwards. In the Me by Starck and the Starck 3 toilets, the basin and the rest of the toilet appear as an optical unit.